Roth Alfie review | What Hi-Fi? What's this ALFiE all about? Well, Roth Audio has delivered an all-in-one system that aims to cover all your second-room video and audio requirements – and has named it either after a viciously amoral Michael Caine character or an idiot soap-opera publican. Luckily, Roth's ALFiE is more useful than both. It's a compact box (11 x 36 x 29cm), into which is crammed 2 x 10 watts of stereo power and an extra 20 watts to drive a downward firing subwoofer. There's a slot-loading disc drive that's able to read DVDs, CDs and CD-borne MP3s, an AM/FM tuner and an elegantly integrated iPod dock. There's an auxiliary input too, and the unit's bedroom credentials are further enhanced by the inclusion of an alarm function. There's a lot to consider in performance terms, then. 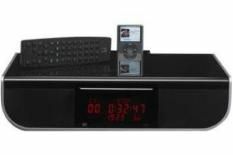 As a DVD player, the ALFiE is an ideal second-room unit – it may top out at component video outputs, but 576i pictures delivered this way are colourful and high-contrast. There's picture noise in more testing scenes, and restlessness to edges or complex patterns, but motion is gripped well and sound is far superior to that of any TV you might have in your bedroom. Sound from CD, radio or iPod is a slightly more qualified success. The ALFiE is never less than listenable, delivering music with assurance and enthusiasm – but the Roth's bass notes sound boxy and overconfident. There are tone controls available to try to even things out, but the exhibitionist bottom end is not to be dissuaded. ALFiE gets a lot right – so why only four stars? Mostly, it's because the machine is a trial to use. The remote control is unpleasant and uncertain, FM radio does without RDS, the display forgets how long a second lasts when playing an iPod, you can't eject a disc when using a different input and the touch-sensitive controls on the unit aren't sensitive at all. We could live with the rather overblown and unnatural bass but we'd struggle to endure ALFiE's ergonomic shortcomings.